Since a couple of weeks ago all the attentions turned into the new Android 4.0 release, called Ice Cream Sandwich, and the new Samsung flagship model, the Galaxy Nexus, but some may have noticed that Samsung is apparently rolling out for some European i9000 Galaxy S handsets the Android 2.3.5 firmware update, available through Samsung’s Kies software. While it is great to watch Samsung still providing support for last year’s flagship model, it’s quite disappointing to realize that this phone, one and a half year after being released, is still plagued with some issues. One of the problems is that the custom TouchWiz UI was never really rock-solid stable. 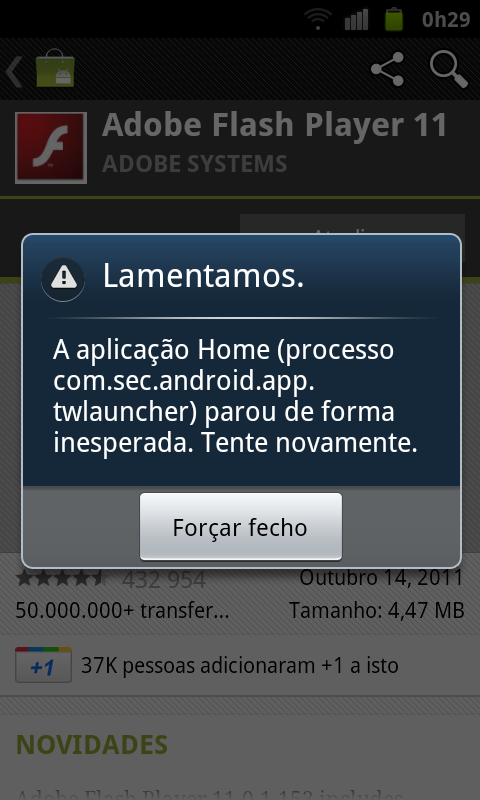 Even after installing the latest Android 2.3.5, the TouchWiz launcher occasionally crashes as you can see below. It’s not as bad as in Android 2.1 or 2.2 when I had to pull the battery off the phone because it crashed completely, specially after playing a game such as Angry Birds for more than 15 minutes, but I believe there’s still a lot of work that needs to be done. I really do not understand what’s the point in not using Google’s Android standard launcher and spend time, money and resources working on a custom UI like TouchWiz, offering a less good user experience, decreased stability and increased memory consumption. The only Android manufacturer custom UI that seems to offer some benefits in the UX department, in my opinion, is HTC’s Sense UI although the memory consumption is probably even higher than in Samsung’s TouhWiz, but maybe that’s why HTC’s are very generous in the amount of memory they usually pack inside their phones. This entry was posted on November 20, 2011 at 14:00 and is filed under Android, Samsung. You can follow any responses to this entry through the RSS 2.0 feed. You can leave a response, or trackback from your own site.